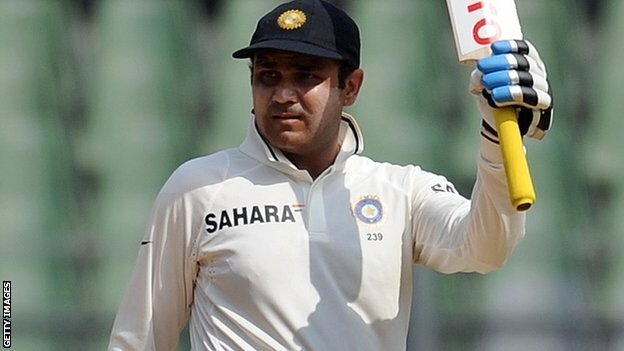 Virender Sehwag who has been a fiery opening batsman for India for many years has been made to sit out for the remaining tests against Australia. Team India has to play two more tests against Australia and the squad for those tests has been announced. The name of Virender Sehwag has not been included in the list. The omission has been due to Sehwag’s poor performances with the bat. He has scored only 27 runs in the current test series after playing two tests. Over the last 3 years, Sehwag has not been able to perform well in tests. Since his century against New Zealand in home tests in November 2010, he has scored only one century in December 2012 against England. His performance has been even more miserable in away series. His last century in away tests was in Australia in 2007. Since then, in 12 away tests, he has just scored 523 runs, averaging only 22.73. On slow and batting friendly tracks in home tests or in subcontinent, he has scored 3622 runs at an average of 57.49. Sehwag has responded by tweeting that he would work harder to earn his place in the team and expressed his confidence to be back in the squad. Prior to Sehwag’s omission, his opening partner Gautam Gambhir was also dropped from the test squad before the start of the Australian series as he had not scored a test century for three years. So far no replacement has been announced for the 34 year old Sehwag. However, the names of Shikhar Dhawan and Rahane are under consideration for opening the Mohali test starting from 14 March. Sehwag has played 104 tests and 251 ODIs.